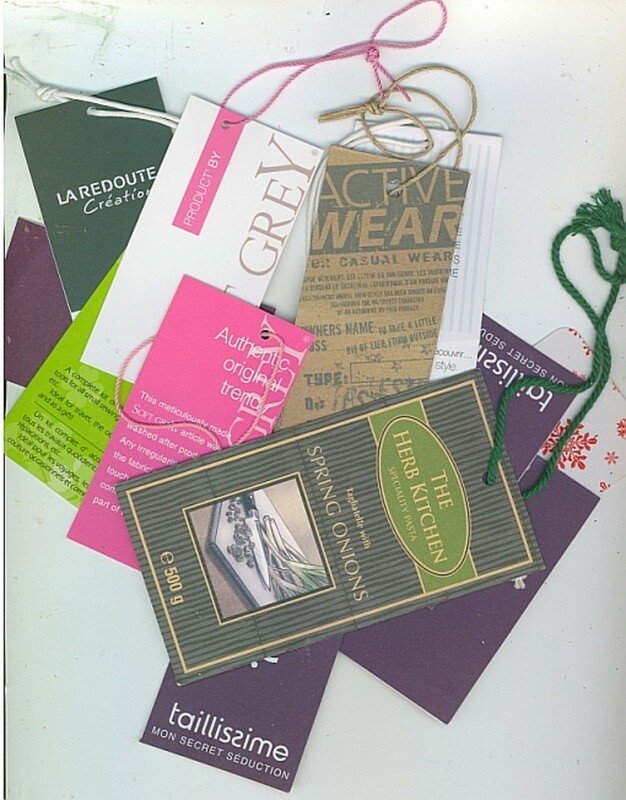 D'you ever find yourself reluctant to throw away garment labels? Or even labels and tags from other items? Some of them are lovely and sturdy, and quite beautiful. I've been collecting mine for years now and have managed to cull them to around 50 or so. I knew that one day I was going to do something art with them. 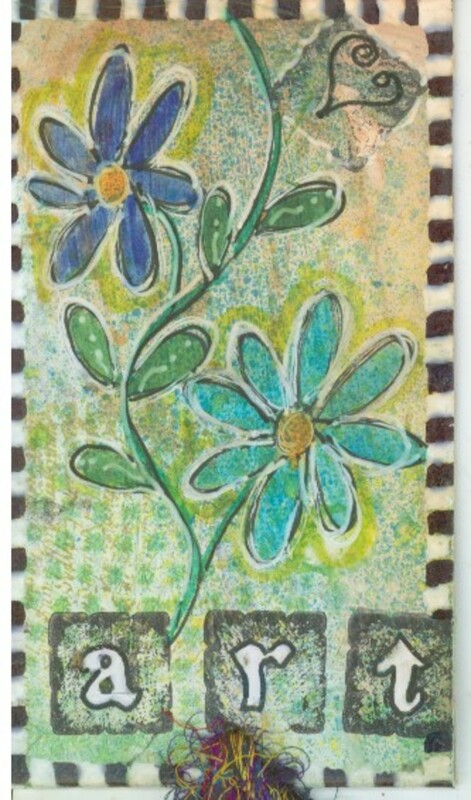 Artists' trading cards have been around for a few years now – they are small pieces of art, often given in swaps, no more than 3 1/2 inches by 2 1/2 inches. There are lots of beautiful examples online and, indeed, there are several books devoted to these wee pieces of inspiration. This would be the perfect thing for my labels. 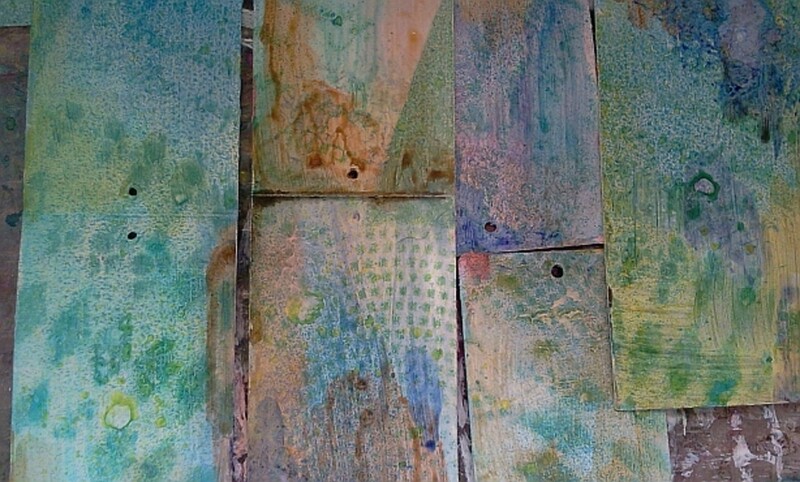 Plus... recycling waste into art is so eco-fashionable! My labels are all different sizes. Some are folded, others are just a single thickness of card... but treating them as small substrates for my own artwork is very appealing. So I decided to give it a go. Here are the results of my first foray into the teeny-tiny world of trading cards... or home-made gift tags, or... whatever. The only supply that you can't manage without in this project is gesso. It covers up the existing printing on the label and provides a good surface to work on. After that, you can decorate anyway you like, using collage, lettering, paint, pens, or anything you can think of. 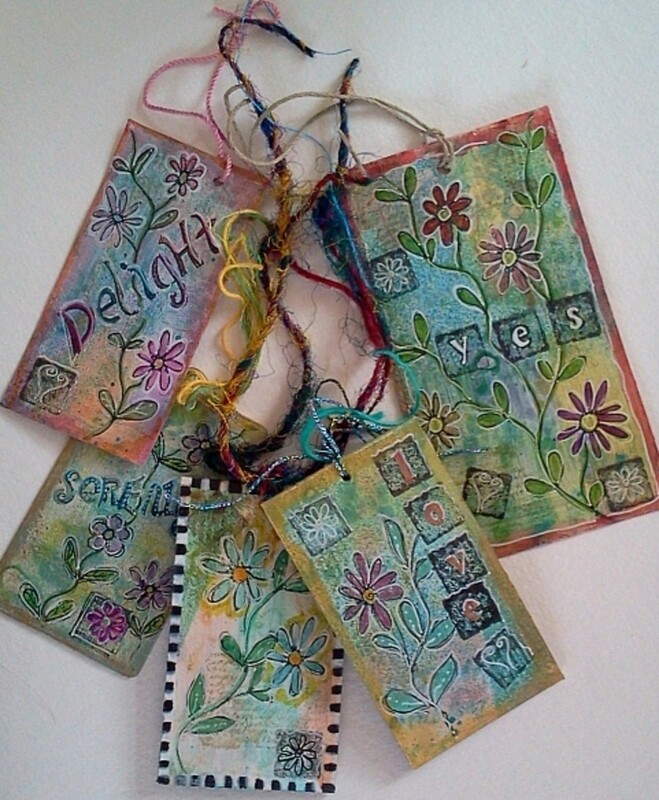 I am including my list of supplies so that you can see exactly how these tags were created. Remove the cords and strings from the labels. The first step is to prepare the labels for painting. 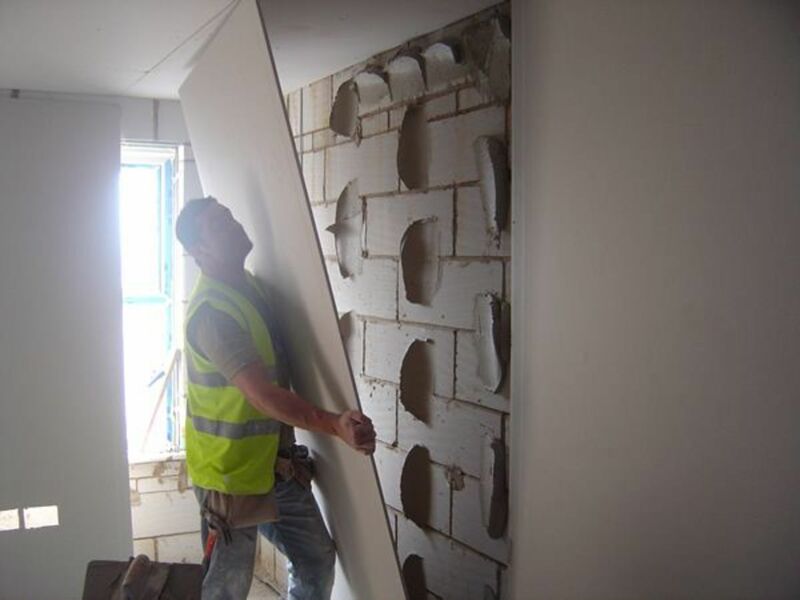 Make sure you have covered up your work surface as this stage can get messy. It's a really good idea to apply gesso and leave the tags overnight. I did not do this, so the surface was a little bit soft when it came to the later stages. Two coats of gesso is recommended unless you want some of the original printing to show through. I did both sides of my labels but that's up to you. If the reverse sides are blank, you might want to leave them to add a written message. Lay down the labels close together – treat them as one single surface. Open up any folded ones. Apply a thin layer of gesso with your large brush. Leave the labels to dry or use a heat gun to help them along. 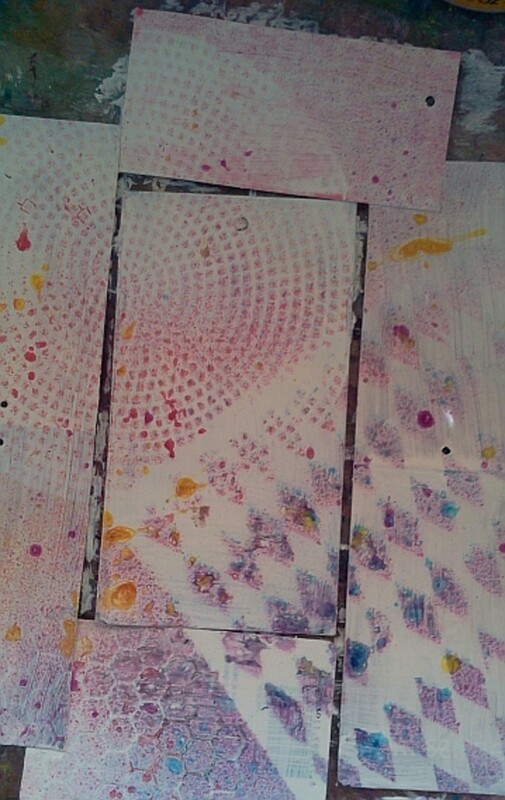 Be careful of getting too close or the gesso will bubble and burn. Ask me how I know this. Apply a second coat, if necessary. 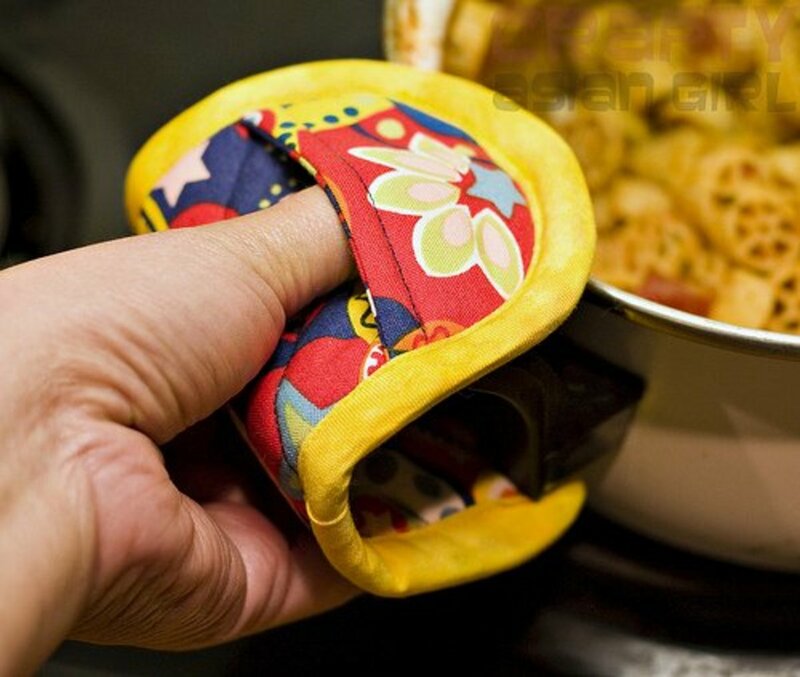 Once the first side is touch dry, you can turn them over and do the other sides. Let the labels cure overnight if you can. 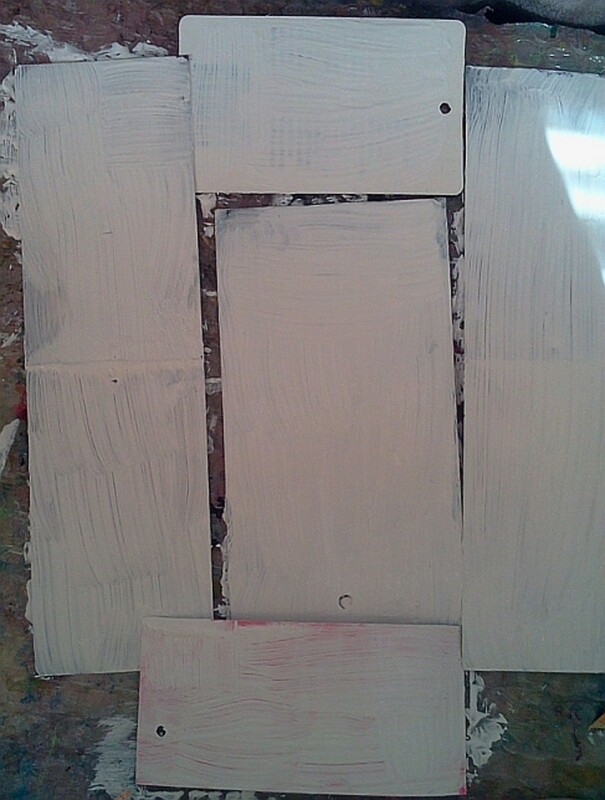 Once the gesso is thoroughly dry, lay down some stencils on top of them. You can use anything with a pleasing design. 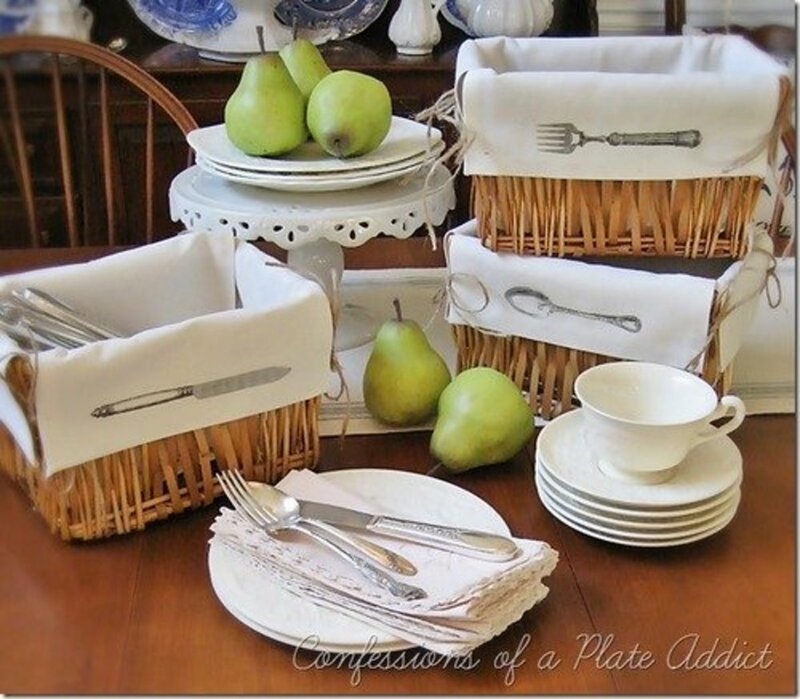 Raid your children's stencil collection or just use things like rubber bands, paper-clips, scissors or any other object that would leave an interesting pattern. Lightly spray one or two colors of inks over the stencils and tags, leave for a minute and then very carefully lift the stencils up. 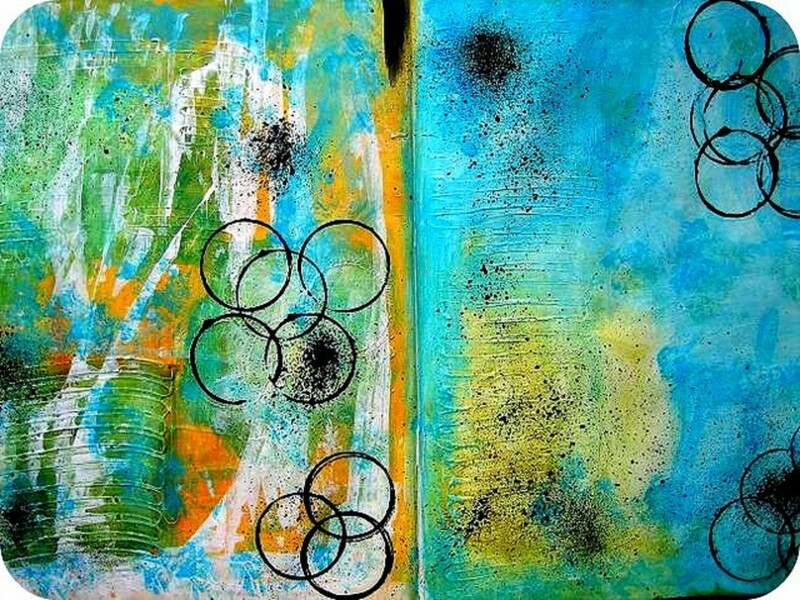 What I usually do at this point is to take my paint covered stencils and lay them face-down on clean paper or a clean page in my journal and press the excess ink off them. Instant background for another piece of art. As you can see in the photo below, my yellow wasn't in the mood for spraying and just dripped. This is fine. I like blobs and drips. You can also use alcohol sprays such as Tim Holtz Adirondack by Ranger, but avoid the ones that can be reactivated with water such as Dylusions. You want this background layer to stay put so that it shows as interesting shadows through subsequent applications of color. You can do this in several ways. It's best to use a watercolor medium of some sort, as it needs to be both colorful and transparent enough to let the stencil sprays show through. I used watercolor paint washes. You could use Tombow Dual-tip brush pens and add plenty of water to spread out their intense hues. Or lightly scribble with Neocolor lls and activate with a water spray. 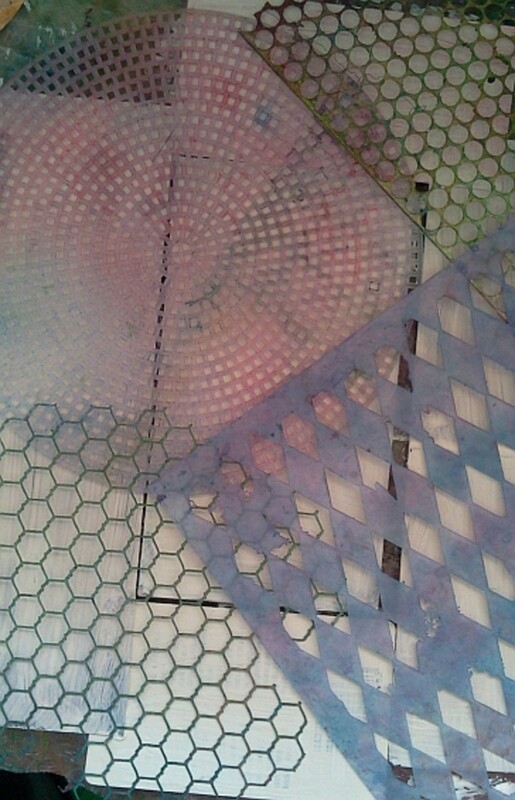 However you do it, just get a transparent layer of color down over the acrylic spray. Once the background is dry, you can start to play. 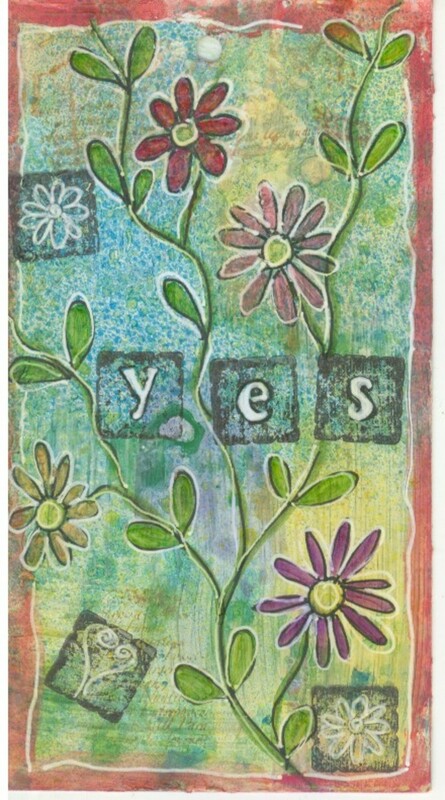 I used a script stamp and a green ink to add a little more to the background. 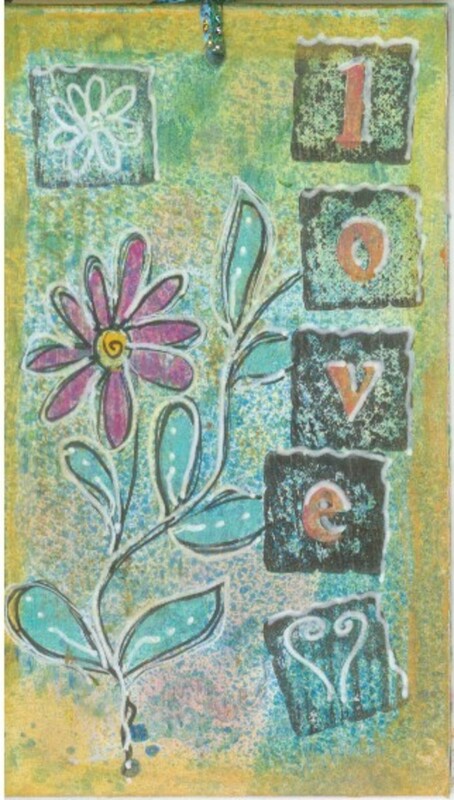 Then drew a few flower and leaf doodles with black pen and stamped some words with an alphabet rubber stamp set. You don't have to follow my example - you can do faces or birds or random shapes. 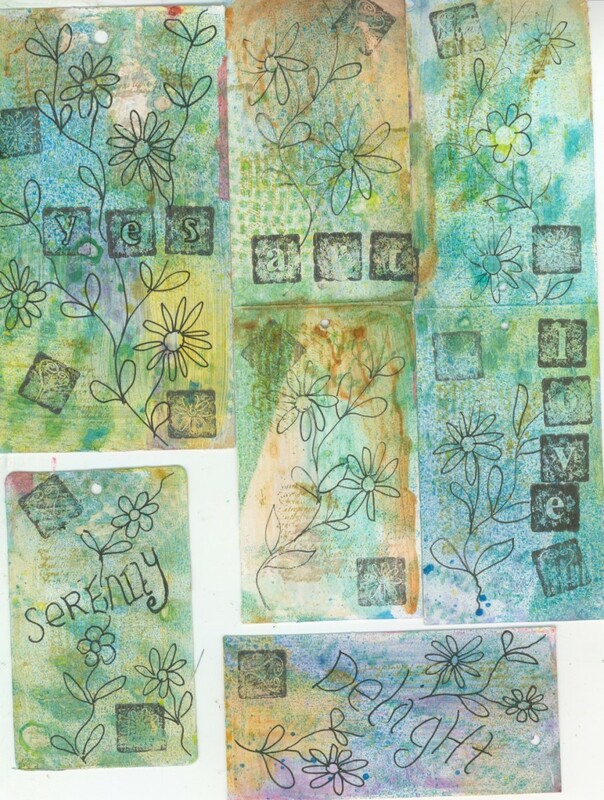 Or just use rubber stamps, or how about some collage? Color in the doodles and/or stamps. If you added collage, consider outlining it with charcoal and then rubbing gently with a blending tool to make it become one with the background. 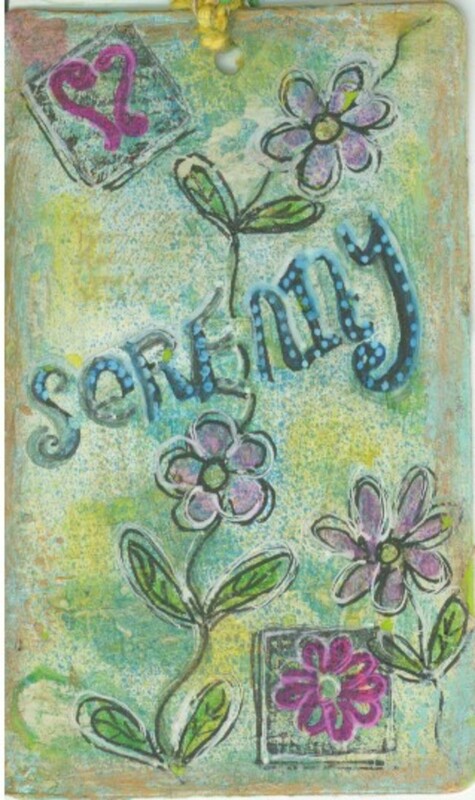 If you like you can add borders with pastels, crayons or pen. Use a white pen to make your design sparkle. 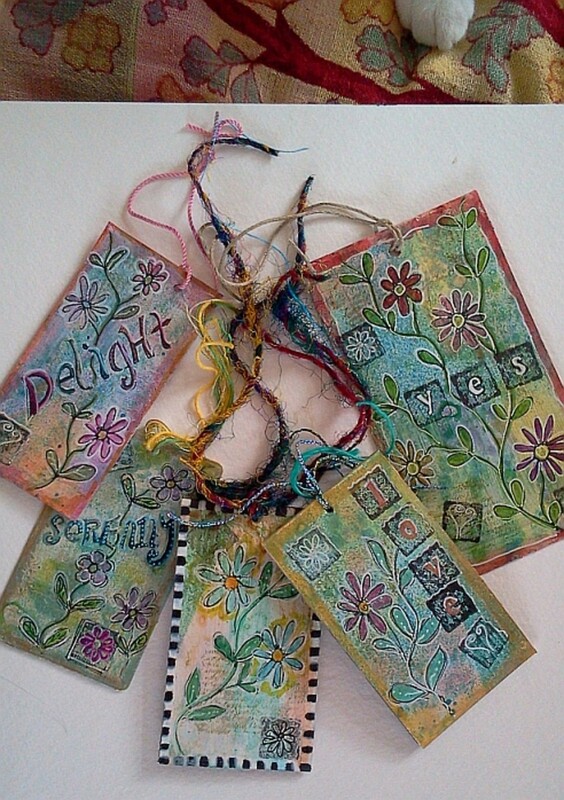 I like to rub on some decorative chalk or pastel to make the tags even more colorful – you just can't have too much color! Don't forget to tie on the string or perhaps some interesting lengths of yarn. Doodles finished with watercolor pencils. Flowers and leaves colored with watercolor paint. Watercolor again. The border is done with a white correction pen and a black marker. Doodles filled in with Tombow Dual Tip brush pens. Do you hate throwing away those attractive labels? Thank you europewalker, Ann1Az2 and savingkathy. 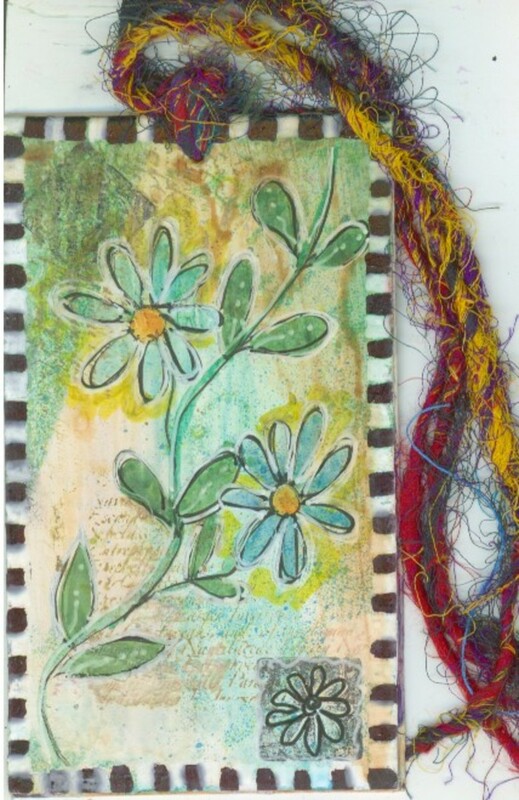 Hope you have fun making mixed media tags! What a fun and creative idea! Your tags are beautiful! Thank you so much for providing the instructions for this. I think I will try to make some gift tags using your techniques. 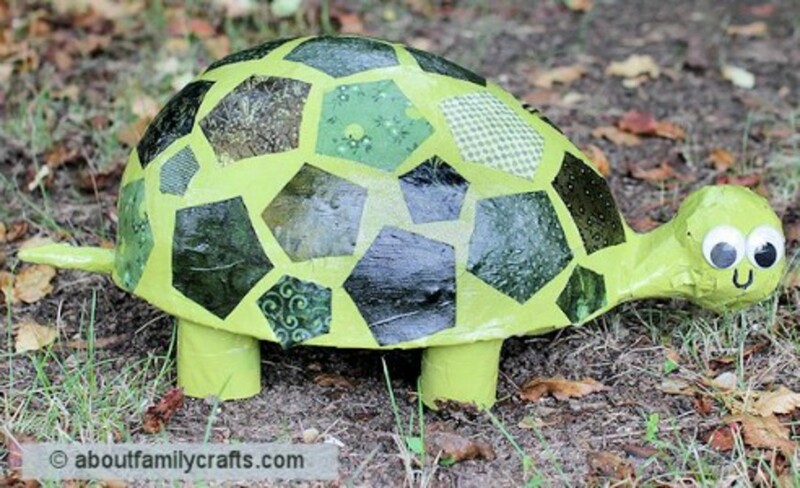 What a cool way to recycle! I'll bet you could use these for gift tags, too. Thank you Natashalh and Robie! I'm glad you liked the hub. Wonderful hub, very inspiring, I love the step-by-step instructions, and your photos add so much! I shared it on HP and also pinned it. Great job! These are so pretty! Thanks for the great instructions. I've always been reluctant to throw those tags away, but I couldn't come up with any good reason to keep them. Now you've given me one! Thanks, Judi Bee and Claudia. I must get round to finishing the reverse sides and add them to the hub! Your tag art is beautiful! These technique can be fun for kids too; I like them to play and learn to do creative, productive stuff all at the same time, instead of just playing. Great hub. Very useful and beautiful - will have to give them a go for Christmas. Always love your hubs! @RTalloni: You are very welcome. Ooh it's great when people take an idea and then adapt it and expand on it and make it grow. You could also do a hub based on the techniques you develop from this. It occurs to me that making signature tags for my work would be a neat use of this idea. The fact that they would be all shapes and sizes would not matter, it's the technique you demonstrate here that would unify them. I could use them for gifts as well as for selling. Thanks! That would work brilliantly, DreamerMeg! Make sure you point out to people that you have included an original piece of art with your gift! Yes, I do hate throwing them out - it seems such a waste but I could start collecting them now and build up some Xmas tags! Thank you so much, Carol777, RTalloni & Joy56. Your enthusiasm and encouragement are worth so much to me. Seriously, this is a fabulous idea. To think of all the tags that have gone out in the trash--but now I know what to do with them. These tags are gorgeous. What a clever and creative idea. I had fun reading this and may even try. Great instructions. Voting UP.